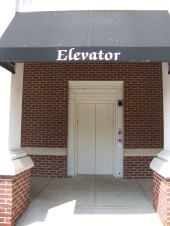 Thyssenkrupp Elevator at Shopping Center in Davidson, NC has a Entrance Door into Private Nook. Video Excerpts from the Lady of the Lake Boat Cruise included are two Man Powered Elevators. HUGE Thyssenkrupp (Dover) Elevators at the Charlotte Convention Center.